Scott County Conservation, in cooperation with the local chapter of Pheasants Forever, received a grant from Riverboat Development Authority to purchase a 4 foot Truax Native Grass Drill (FLXII-86). The drill is designed for planting native prairie grasses at the required shallow depth. With three seed boxes, cool season grasses can be planted effectively. 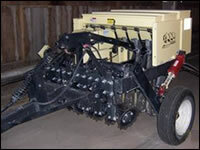 The drill can plant most types and textures of grasses, legumes and wild flowers. This is a no-till drill and can drill into residue or interseed into sod cover as well as a prepared seedbed. The drill, similar to other farm implements, must not be moved at speeds exceeding 20 mph. doing so greatly increases wear on the tires, wheels, and bearings. You are responsible for damages. It is a violation of Federal Highway law to tow an implement without brakes at a speed greater than 20 mpg. 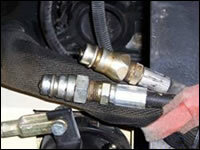 For trailer lights, there is a flat four prong type connector. A 30 hp tractor is required to utilize this implement in a no-till aspect and 25 hp tractor for a prepared seedbed. If you are underpowered, then work with a neighbor. Spring planting is a very busy time of year for this equipment. We encourage Fall planting if possible. This equipment is for use in Scott County, Iowa only. Neighboring Clinton and Muscatine County Conservation Boards both have equipment available. By signing the utilization agreement, the user agrees to provide the location of the area planted and agrees to inspection by Scott County Conservation Board employees for proper utilization. The drill must be picked up and returned on schedule. If this is not possible, then call Scott County Conservation as soon as possible. Late returns will affect others that have the drill reserved. The Conservation Board does not charge to use this equipment however commercial use is prohibited. A valid credit card number is required as deposit for reservation. 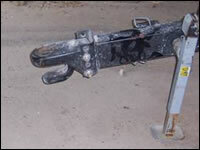 If the drill is returned in an acceptable condition then the credit card number is destroyed. If not, the card is debited for damages. Scott County Conservation Board also has a tree planter that is available to assist in planting bare root seedlings. An agreement is also required for use.